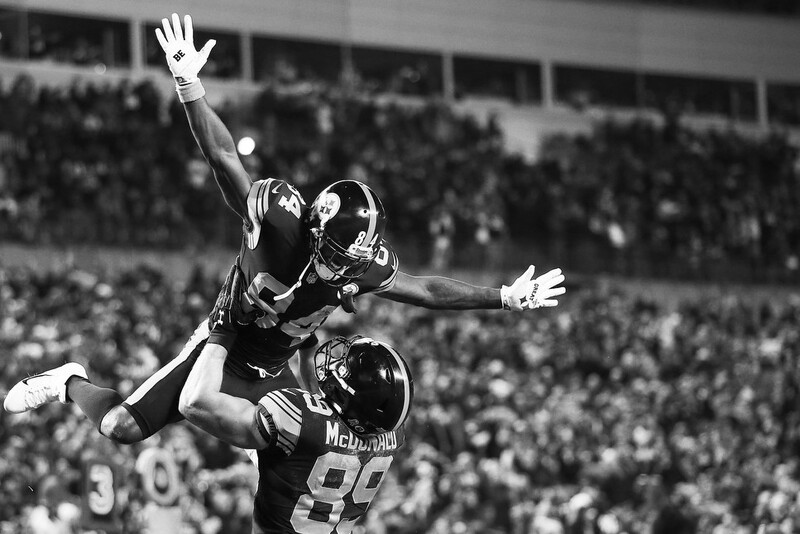 Antonio Brown of the Pittsburgh Steelers is lifted into the air by Vance McDonald following McDonald's touchdown. 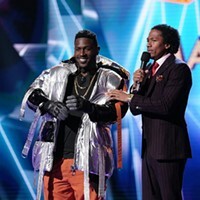 Hours before Antonio Brown flew down the sideline, he was clocked going 100mph down McKnight Road in his Porsche. He and the entire Pittsburgh Steelers team never took their foot off of the pedal in their game against the Carolina Panthers. 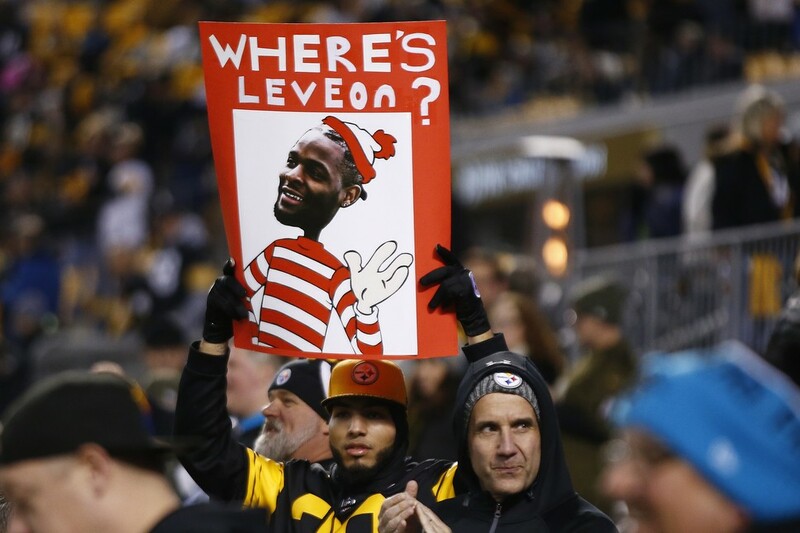 Tonight's game set the NFL record this season for most points scored and Pittsburgh did it at will. 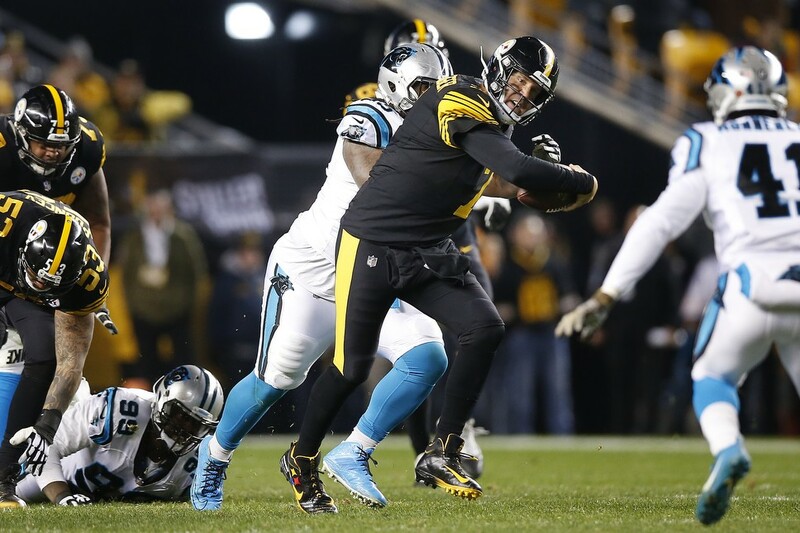 Five touchdowns for Ben Roethlisberger, all to different receivers, put him in sole possession of 7th place all-time with 350 touchdowns. Pittsburgh improves to 6-2-1 and will travel next to Jacksonville to face the Jaguars on November 18th for a 1pm game. 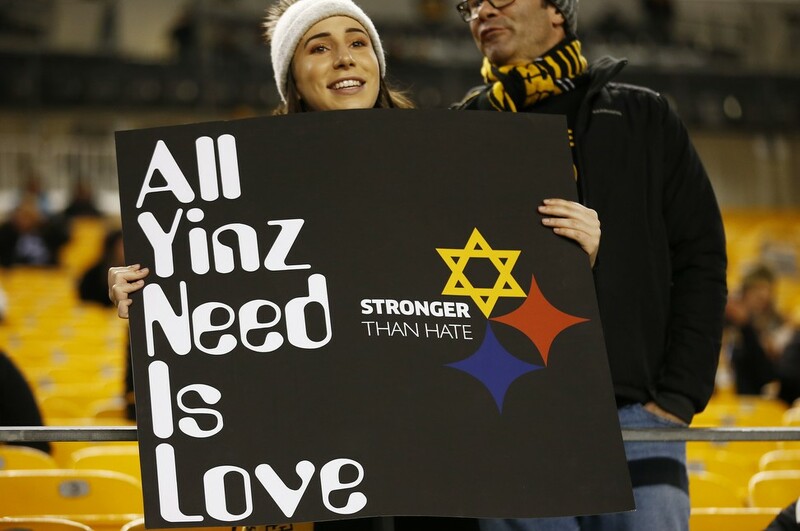 A Pittsburgh Steelers fan holds up a 'All Yinz Need Is Love' sign in honor of the Tree of Life victims. 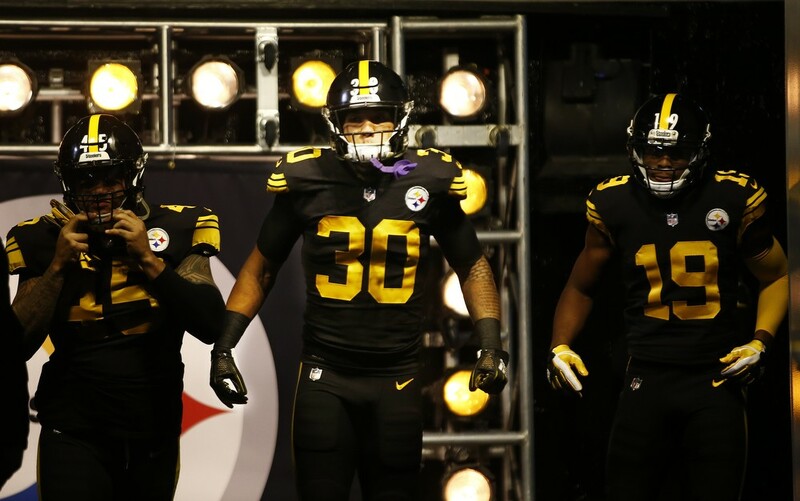 James Conner enters the field with Roosevelt Nix-Jones and JuJu Smith-Schuster. 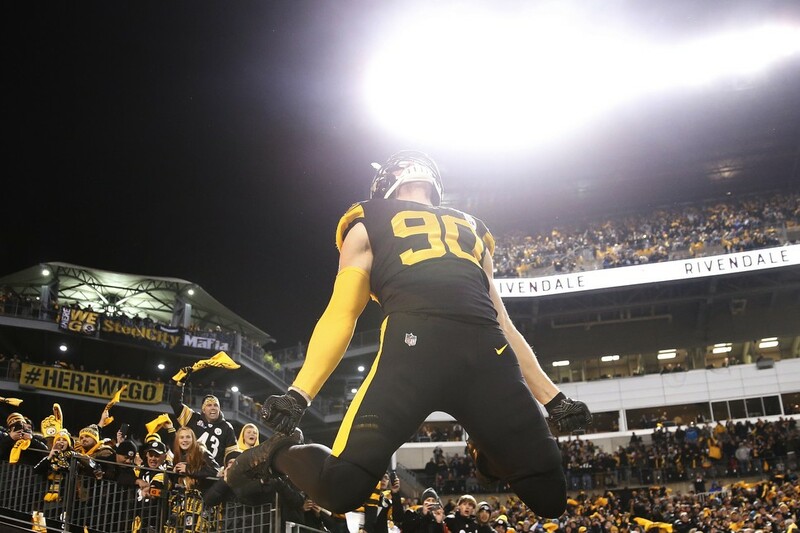 T.J. Watt leaps onto Heinz Field during his introduction. 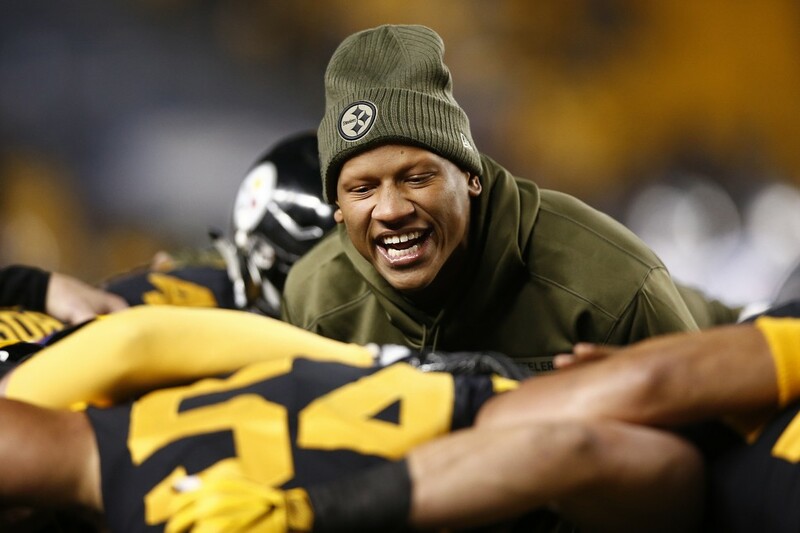 Ryan Shazier gets the linebackers pumped up. 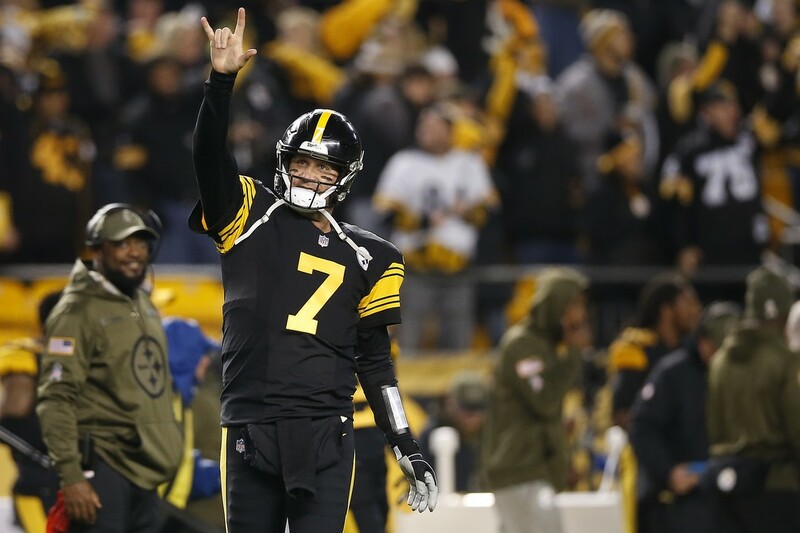 Ben Roethlisberger celebrates his touchdown pass on their first offensive play. 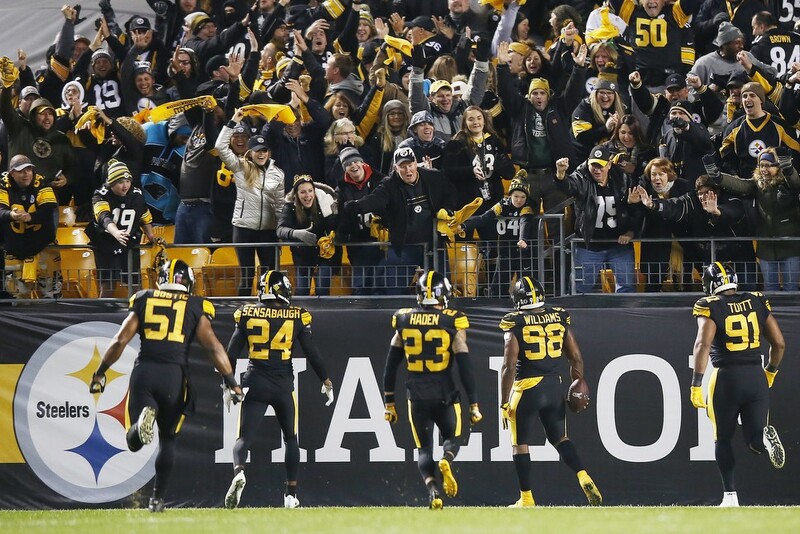 Vince Williams and the Steelers defense celebrate a pick six. 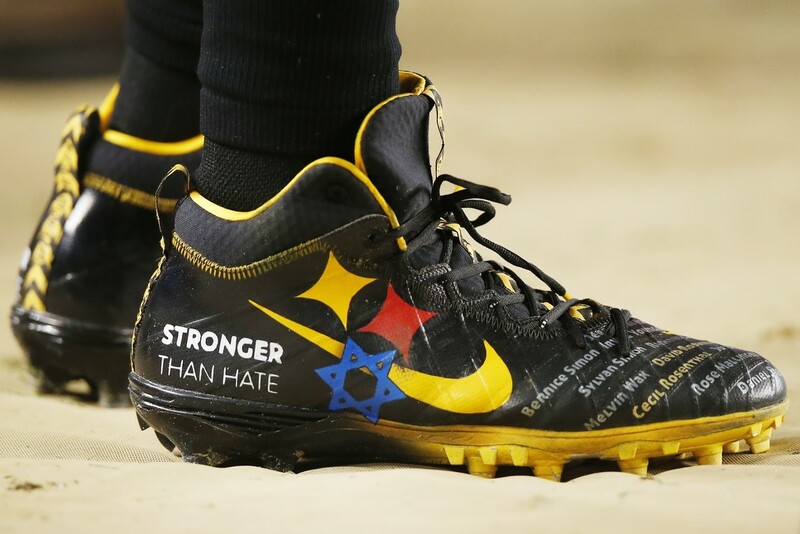 Roethlisberger wore custom cleats honoring the victims of the Tree of Life synagogue mass shooting. James Conner runs past Eric Reid on their second drive of the game. 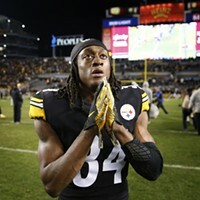 Conner celebrates his touchdown against the Panthers. 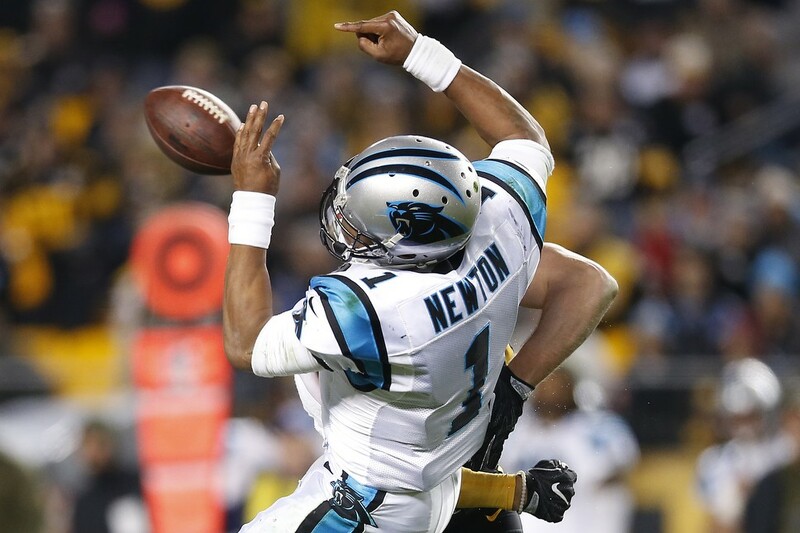 Cam Newton is sacked by T.J. Watt. Roethlisberger uses his feet to pick up a first down. 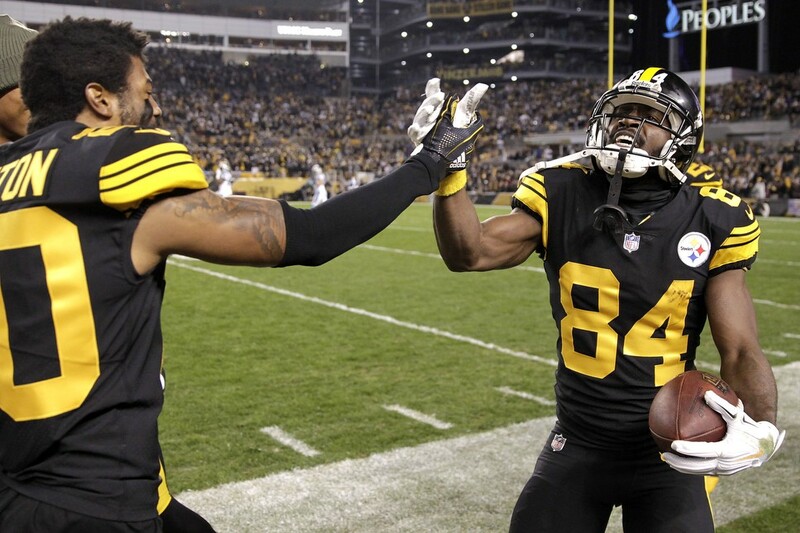 AB celebrates his touchdown reception with Cam Sutton. Vance McDonald is upended by Eric Reid following a catch. 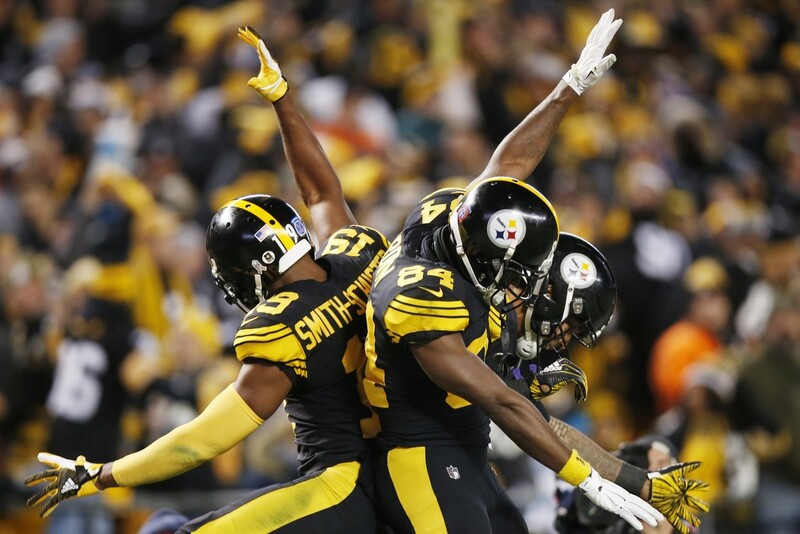 JuJu, AB, and Conner celebrate yet another score. 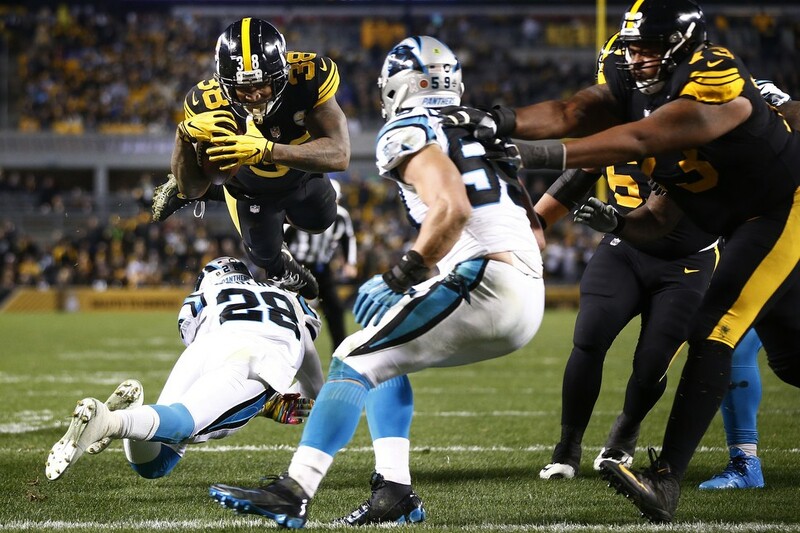 Jaylen Samuels leaps into the endzone for his first NFL touchdown.